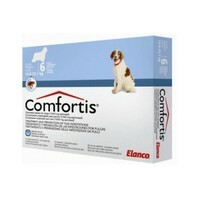 Comfortis Palatable Flea Tablets for Dogs can be given monthly. These effective tablets starts killing in 30 minutes and is 100% effective within 4 hours. Comfortis Flea tablets works for up to 4 weeks and is recommended for dogs with immediate flea relief needs, dermatitis issues including FAD, dogs that swim or are bathed frequently and homes with other pets. These palatable tablets are chewable and can be fed on their own or with food. Each tablet contains Spinosad 1040mg. Suitable for dogs weighing 14.8 - 23.1kg. 1 pack contains 6 tablets.